Many hydroponic growers - especially large scale ones - can benefit greatly from mixing their own custom nutrients. Not only can this save money in the thousands of dollars per month but it can also give you an unprecedented degree of control when compared with store-bought nutrients. On today's post I am going to write about five important things you should know when mixing your own nutrients so you can avoid many common problems that can arise when you start preparing your own stock solutions. More concentrated solutions are not always better. When you prepare a concentrated liquid you would usually want to go with the highest possible concentration factor so that you can prepare as much final nutrient solution as possible with as little stock solution as possible. However trying to get into higher concentration factors (1:400-1:500) can cause important issues due to the solubility of the salts used and the temperatures the stock solution will be exposed to. It can also cause high inaccuracies with variable injector setups since the dilutions will be much smaller. For starters go with a 1:100 concentration factor and only start going higher when you get more experience. If you're using injectors I would generally avoid a range higher than 1:250 unless you do more extensive calibration procedures with your injectors. Impurities can cause important problems. Some salts can come with significant levels of impurities - sometimes mainly additives - that can cause substantial issues when preparing your nutrient solutions. Lower quality grade salts - mainly those used for soil fertilization or those that are OMRI listed and come straight from mining with no refining - can generate problems within your mixing process. These problems range from insoluble left-overs in tanks to toxic amounts of some micro elements. To ensure you get the best possible results use greenhouse grade fertilizer salts and try to avoid sources of salts that are OMRI listed. Synthetic sources that have been heavily purified are your best bet in ensuring the best possible results. Use slightly acidic deionized water to prepare the solutions. Most water sources in Europe and the US are very heavy in carbonates an therefore inappropriate for the preparation of concentrated nutrient solutions as these ions can cause salts to precipitate when preparing concentrated solutions. To fix this issue the best thing would be to use distilled water but - since this is often not an option - the next best thing is to use reverse osmosis water and add a bit of acid (0.5mL/L of nitric acid, other acids may cause other problems) per gallon of concentrated solution. This will ensure that everything gets dissolved and will eliminate the carbonates that can be naturally present within the water. Of course never, ever use tap or well water to prepare concentrated hydroponic solutions. Salts take up volume, take that into account. A very common mistake when preparing solutions is to just add the salts to the final volume of desired stock solution to prepare. This is a mistake since the salts also take up volume. 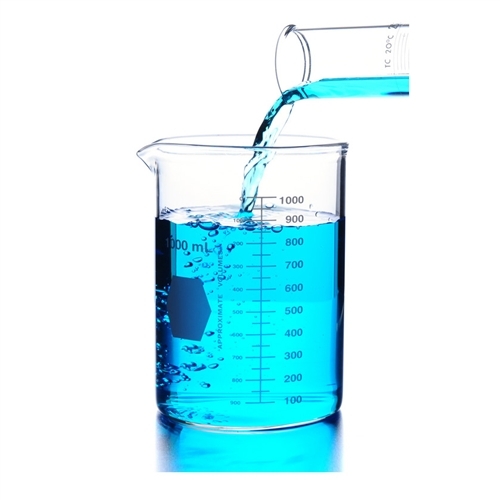 If you want to prepare 1 liter of concentrated solution and you need to add say, 100 g of potassium nitrate, adding 100g of potassium nitrate to 1L of water would generate a solution with a final volume greater than 1L. To avoid this problem always add the salts to half the volume of water and, after the salts have dissolved, complete to the final volume of desired solution. Add salts from the smallest to the largest quantities. When you prepare hydroponic solutions it is often better - especially when you're starting - to add salts from the smallest to the highest amounts needed. If you make a mistake at some point then you will minimize the amount of mass of salts that has been wasted due to this fact. If you make a mistake adding a micro nutrient you will only lose a small amount of the other micro nutrients instead of losing a huge amounts of macro nutrients due your order of addition. It is also true that the substances that are added in largest quantities are commonly nitrates and these salts have endothermic dissolutions - meaning they cool solutions upon addition - so it is better to add them last so that they can benefit a bit from the heat generated by the dissolution of the other salts. The above is not an exhaustive list of pointers but it should save you from some important trouble when preparing your own initial nutrient solutions.Although some of these points may seem obvious to those that have experience preparing their own solutions they may prove invaluable to those who are just starting their journey in concentrated nutrient preparation. Thanks for another great write-up! You say to add .5mL/L nitric acid to deionized water when preparing solutions because distilled isn't always available. Since I plan on using distilled water, would I benefit from adjusting pH the same way before mixing salts? Thank you! Nice write up. What is the concentration of nitric acid you're adding at 0.5 mL/L? Depends on the concentration of the nitric acid you use. The nitric acid will also react with carbonates in the water so in the end the concentration of "nitric acid" will probably be close to zero. You will end up with some Ca/Mg/Na nitrates in solution. Sorry, I mean what concentration of nitric acid are you using, e.g., 2N? I generally use 60% Nitric acid. Another great write up, Nice info. I recently prepared hydroponic nutrient using your software which was of great help. My strawberries are coming well. But the problem is in my stock B tank (10 liters at 100X concentration) some cotton like thing is growing and floating around. I guess it is some form of fungus. I added few ml of some peroxide to B to kill it off. It worked cotton like growth turned brown and came on top but after few days again it started growing. So is there any solution to this?. What i can think is to either add some preservative to stock solution or some how raise the PH of stock above 5.5 to deter fungus growth. Though I am skeptical of both the options. i hope you would have better suggestion on this problem. Hi Tushar, You definitely need to add a preservative and possibly change the pH environment of your stock B solution. If you want to discuss this further please feel free to book an hour of consultation time. Thanks for writing, Best Regards, Dr. Daniel Fernandez Ph.D. Thanks Daniel for the guidance! When preparing stock concentrates for use in the subsequent two weeks or so, in a tank, what is the lowest pH for A & for B we can safely go without irreversibly dropping the nutrients out of solution when we're doing complete hydro vegetable formulas, if that is important to us? The micros are chelated with EDTA except iron has a portion of DPTA, too. Thanks for any insight! Hi, have you seen the very nice Excel macro spreadsheet from University of Pisa that is Open Source license. It is a wonderful resource. I combine that with water testing from JR Peters. Helps me as a hobbiest. I never buy nutrient solutions.